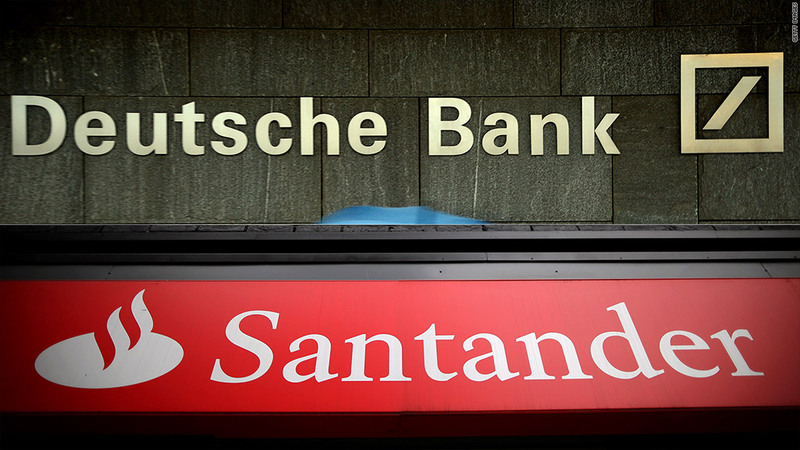 Deutsche Bank and Santander, two of Europe's biggest banks, reported weaker-than-expected earnings Thursday. Two of Europe's biggest banks reported weaker than expected earnings Thursday as they took hefty charges to reduce their exposure to the region's economic woes and move on from past mistakes. Santander (SANPRA), Spain's biggest lender, took total charges of 18.8 billion euros in 2012 -- 6.6 billion more than the previous year -- as it halved its exposure to the country's depressed real estate sector and increased provisions for bad loans by 28%. Those measures cut annual net profit by 59% to 2.2 billion euros, and the bank's shares fell 2.5%. "2012 marked a turning point in terms of profit," Santander CEO Emilio Botin said in a statement. "With the exceptional write-offs behind us, we should see a marked recovery in results." Spain has been forced to turn to the European Union for help to bail out eight of its weakest banks after a property bubble burst, tearing holes in their balance sheets. Santander passed an independent review of capital adequacy at Spanish banks last year. Capital has been stretched further by the eurozone recession, which deepened in Spain in the fourth quarter as domestic demand collapsed in the face of record unemployment and government austerity measures. Banks are scrambling to repair balance sheets to meet new capital rules designed to prevent a repeat of the 2008 financial crisis. Germany has come through the eurozone crisis largely unscathed, although its economy did contract in the fourth quarter of 2012. Its biggest lender, Deutsche Bank, posted a net loss of 2.2 billion euros for the last three months of the year after it took an impairment charge of 1.9 billion euros against underperforming assets and another one-billion euro charge to cover legal risks. Like many of its peers, Deutsche stands accused of manipulating Libor benchmark interest rates. UBS and Barclays together paid about $2 billion last year to settle those claims with U.S. and other banking regulators. It also faces a number of other legal challenges. Deutsche (DB) shares were up more than 3% midday Thursday as investors focused on a significant improvement in the bank's core capital ratio.